See the hours and minutes until your next event. Is there a better alternative to Nectar? Is Nectar really the best app in Desktop category? Will Nectar work good on macOS 10.13.4? 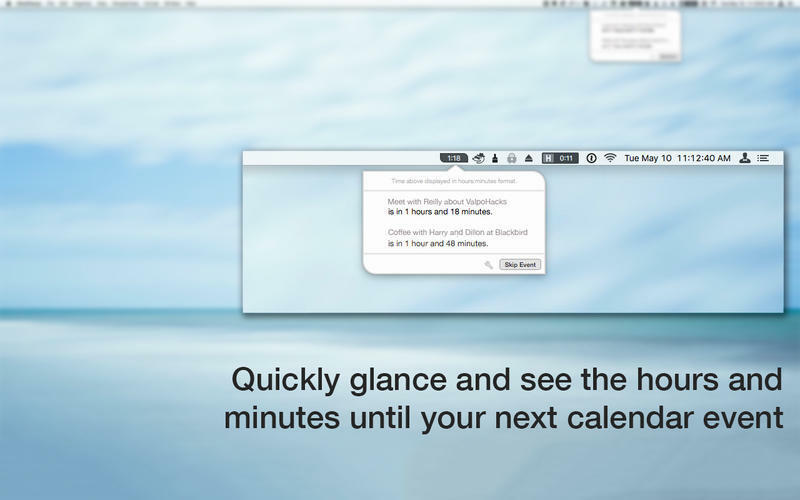 Nectar lives in your menu bar, and helps you countdown to your next calendar event. See the hours and minutes until your next event, or share information about the upcoming event with co-workers, friends, and family. Nectar is simple, it only takes up a sliver of your menu bar and will blink when your next event approaches, so that you know that it's almost time for whatever you have next. Notification center integration can also provide a quick alert before the event occurs, at a time interval that best suits your convenience. Removed some development logs that could flood Console.app. Nectar needs a review. Be the first to review this app and get the discussion started! Nectar needs a rating. Be the first to rate this app and get the discussion started!